Well, hello Friends! So lovely to see you here today. What a great collaboration week we had with Stampendous and Scrapbook Adhesives by 3L with so many beautiful projects shared. My DT Sisters on both teams have really rocked this collab. If you haven't seen those projects yet - it's well worth a look! Thank you all so much for your sweetest comments on my mini album and personalised tape dispensers MyStik. They were really appreciated. 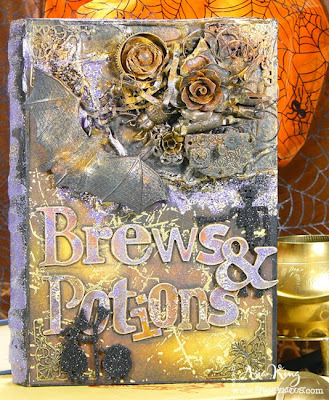 Today I would like to 'bewitch' you with my mixed media brews and potions project. 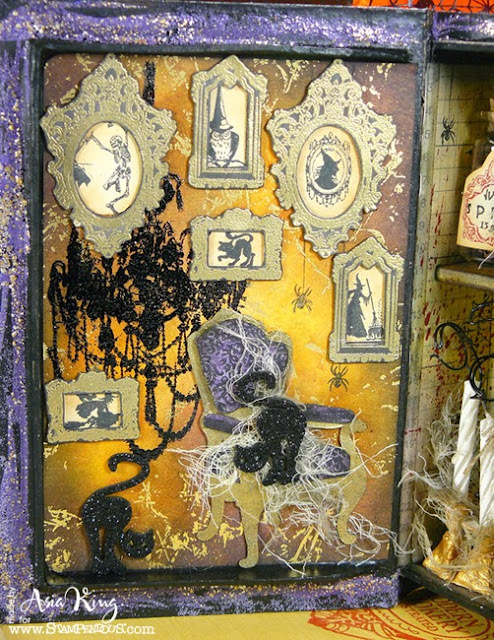 Although I don't really participate in any Halloween adventures, I just couldn't resist playing with this paper mache book which I turned into a Dark Magic home decoration. 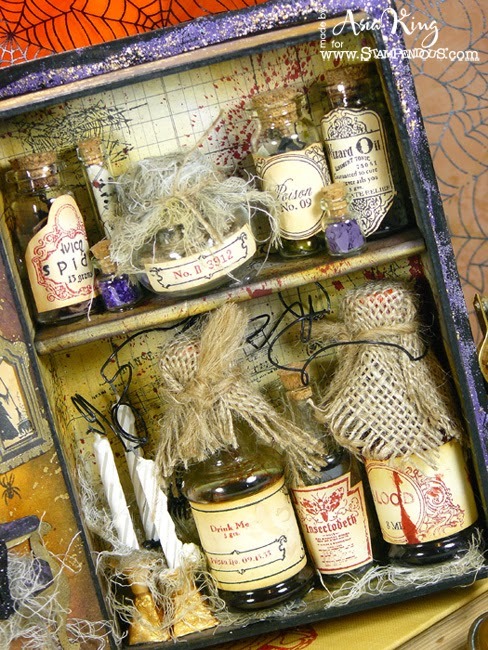 Above you can see the front cover of my 'Witch's Brews Anthology' book and below the inside...well, inside you can find everything there is to find in a 'respectable' witch's house lol. Actually I wonder... what are the qualities a respectable witch should posses? Just asking, you know, being curious... no other reason really lol! I started by covering my book with Adhesive Sheets from Scrapbook Adhesives by 3L. Next I used some thick string to shape a spider's web on the front and covered it with tissue paper as a texture base for my mixed media assemblage. Not sure if you can clearly see it on the picture below. I'll have some step photos shared on Stampendous blog today - please feel free to have a look there too. 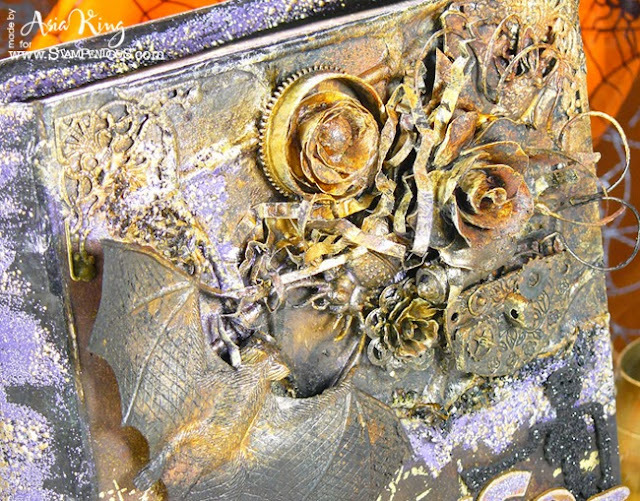 My spooky assemblage of metal flowers, gears, light bulbs, wires, bats and spiders is a combination of DODZ™ - 3D, white gesso, texture paste, black Crushed Glass Glitter, Aged Wine Embossing Enamel, Tattered Angels glimmer mists and Cosmic Shimmer mists. The paper I used has lovely gold foil 'splatters' which acted as a resist for my inking. The inside of the book was stamped with the fabulous stamps from the Perfectly Clear sets Halloween Charms, Chandelier and Damask Chair. 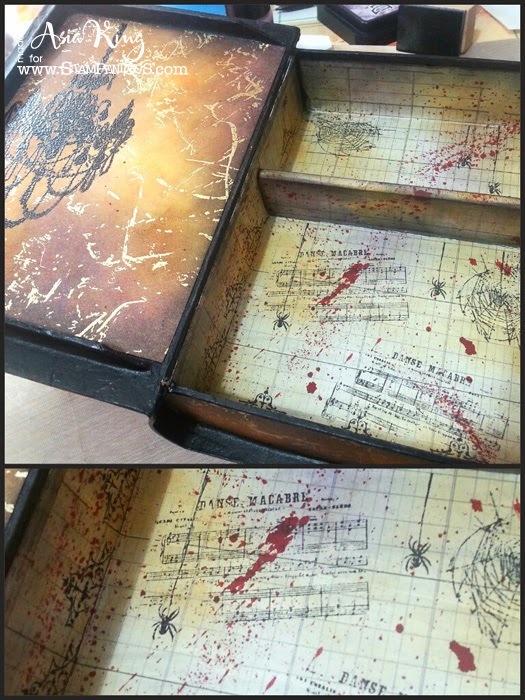 And can you see those blood splatters inside? I used food colouring potion (that now happily lives in the Blood Vial) and flicked it with a paintbrush. NB. A word of caution. Food colouring seems to stay on your fingers forever. I suggest using gloves for that step. I didn't. Bad move it was :(. And here you can see how I decorated the title grunge paper alphas (Tim Holtz) - all inked with distress inks and glimmer mist sprays and sparingly heat embossed with the yummy Aged Wine Embossing Enamel. I also added layers of Aged Wine goodness to the various parts (externally and internally) of the book cover. Oh, my favourite part now. Here you can see the witch's 'living room' in its full glory, with the lovely chandelier and the damask chair, black cats (foam stickers from a discount store) and beautifully framed pictures of the witch's relatives... well... you know what I mean. Family 'heirloom' stuff lol. 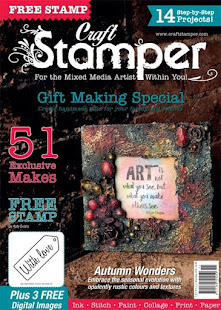 All these stamps are available in the UK on the Stamp Man's website :). And here is the view of all the magical brews and potions from fresh blood, spider juice, random poisons (Trick or Treat Color Fragments) to heather oils (glass glitter and colour fragments from the Purple Encrusted Jewel Kit), stored in vials adorned with Poison Labels. So what do you think? Trick or Treat? Treat I hope! 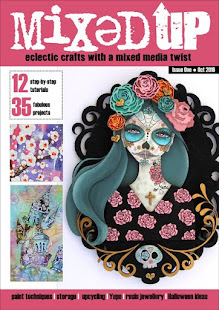 If you're looking for more inspiration for Halloween themed home decor you might also like to check my Halloween Mixed Media Lantern tutorial. Thank you so much for popping in today and for your lovely comments. 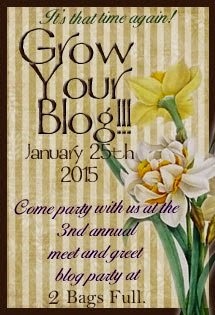 If it's your first time visit to my blog feel free to make yourself at home and browse around. Even better - click the follow me button and never miss another post! :))). great project! all details are amazing! 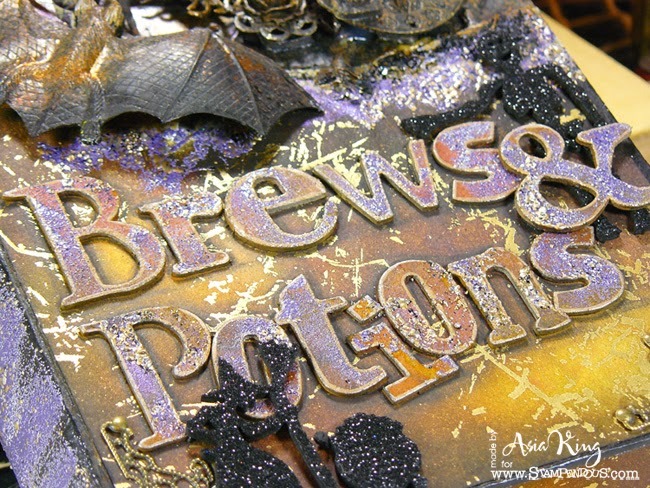 OMG - fabulous grungy Hallowe'en artwork Joanna - love it! Holly Molly Asia!!! This is freakin' fantastic!!! You have outdone yourself! 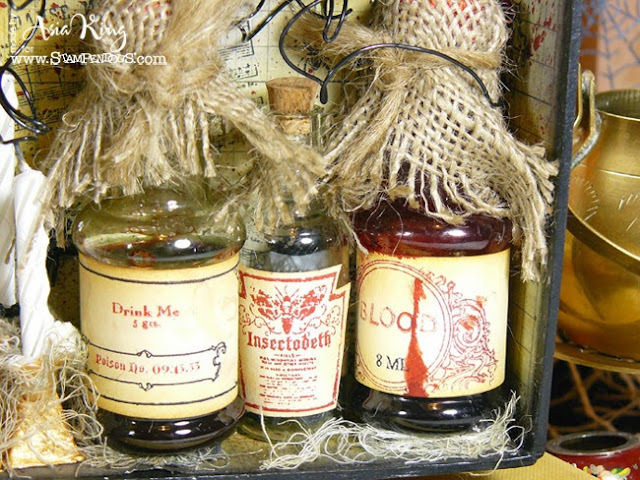 This is absolutely spooktacular! I keep coming back to find new details that I missed the first 10,000 times I looked at it! All I can say is WOW WOW WOW WOW WOW WOW WOW WOW! I N C R E D I B L E ! ! ! TFS! If you find that it needs a home I could find a spot for it to be proudly displayed! If you need my address just give me a shout and I will get it to you! LOL In all seriousness it is a true work of art and anyone would be proud to display it in their home! Happy Halloween! Holy Cow!!!! WOW!!! This is AWESOME!!! 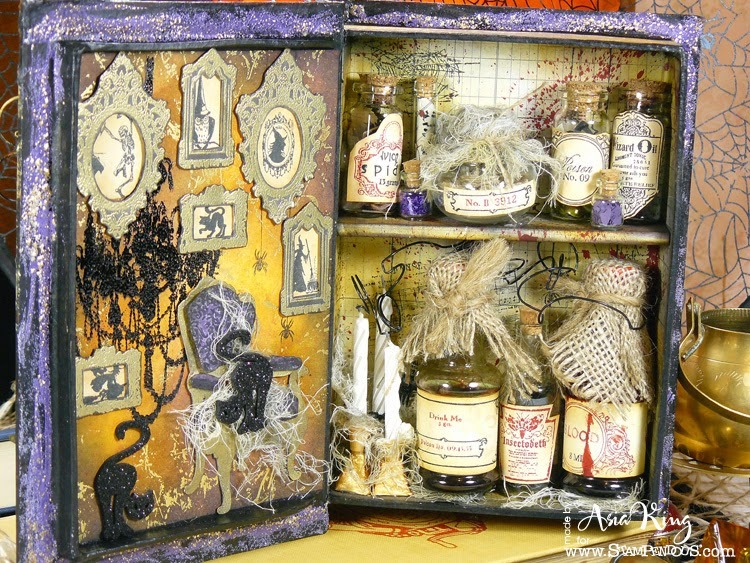 A brilliant book box Joanna, I love the textured cover right through to the potions on the shelves. A brilliantly created piece of artwork. WOW!! Oh my this is just amazing ... The outside is just so clever and full of wonderful detail ... then when opened ... well, what can I say? It's just terrific! Looks like you had a great deal of fun with this ... Hats of to you! This is gorgeous, I love all the details. Thanks for linking it to Tando this month. Fabulous and great project Joanna. Holy cow! I was so wow'd by this piece and then you showed pictures of it opened up!! Then I was double Holy Cow-ing! This is truly stunning and I adore the whole vibe of this piece. You've shown so many techniques and skills and I love how this is a totally new interpretation of traditional holiday decor. Excellent job and I'm so glad that you shared your talents with us for the Simon Says Stamp Monday Challenge! WOW! stunning Joanna, how totally fabulous! 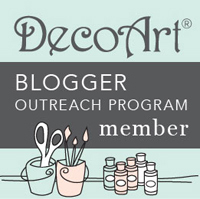 Thank you for playing along with the Craft Stamper Blog Challenge!